Edward Steichen photographs, Art et Décoration magazine, April 1911. The birth of modern fashion photography is often credited to a spread by Edward Steichen featured in Art et Décoration magazine in 1911. However, surprisingly little, if any, attention is every given to how Steichen took many of his groundbreaking visual cues from fashion illustration, specifically the work of artists Paul Iribe and Georges Lepape in two luxury, limited-edition fashion albums entitled Les Robes de Paul Poiret (1908) and Les Choses de Paul Poiret vues par Georges Lepape (1911). Steichen’s photographs, perhaps not surprisingly, are also of the work of the avant-garde couturier Paul Poiret who was always seeking fresh, unorthodox means of marketing his modern fashion designs. Steichen successfully achieved this by allowing mood, atmosphere and artistic license to take precedent over sharply-focused, detailed depictions of the garments for blatant commercial purposes, as was the status quo in fashion photography at the time. Indeed, this was an exciting, new direction for fashion photography… but not illustration, which had undergone a dramatic remapping at the hands of Iribe three years prior. 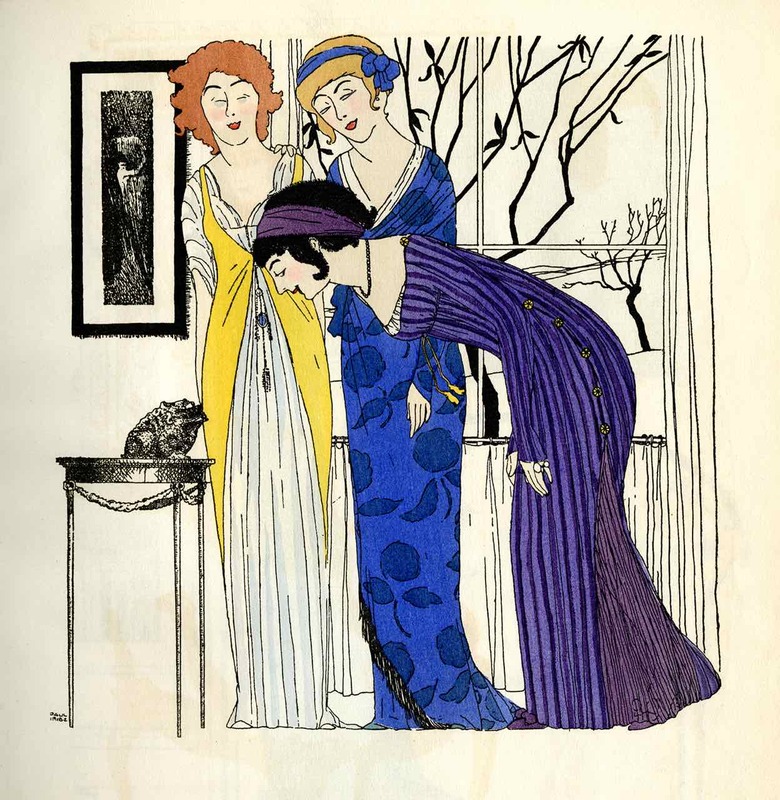 Illustrations by Paul Iribe in Les Robes de Paul Poiret, 1908. This fussy, detailed illustration was typical of the medium at the time. La Moda Elegante, 1908. In Les Robes de Paul Poiret, Poiret granted Iribe complete artistic license in the interpretation of his modern, corset-free gowns, inviting the artist to capture the spirit of his garments versus a detailed, literal interpretation. Any tropes familiar to traditional fashion advertising dissolved at the hands of Iribe: his figures were flat and two-dimensional, his color palette bold and vivid. Iribe’s style was distinctive, taking clear inspiration from Japanese woodblock prints. The use of the laborious hand-stenciling technique known as pochoir to reproduce Iribe’s illustrations ensured that each of the album’s fifty copies retained the painterly qualities of the artist’s original work. When a small selection of Poiret’s affluent clientele received the album as a gift, they were not accepting a traditional catalog of a couturier’s designs, but rather the portfolio of two artists: Iribe and Poiret—or so Poiret would have them believe. “I am not commercial,” Poiret told the New York Times in 1913, “Ladies come to me for a gown as they go to a distinguished painter to get their portraits put on canvas. I am an artist, not a dressmaker.”[i] Poiret was undeniably in the business of selling clothes but his genius, and resulting success, lay in how he sold his clothing, cleverly presenting his designs within a realm traditionally inhabited only by fine artists. Les Robes de Paul Poiret, 1908. Les Robes de Paul Poiret effectively laid the groundwork for the production of Les Choses de Paul Poiret vue Georges Lepape three years later, which possessed many of the same stylistic principals as its predecessor. Together, the two albums validated fashion illustration as an outlet for artistic expression, a dialogue between fashion and art that would inspire an entire generation of artists of the Art Moderne and Art Deco eras. The stylistic influences of Iribe and Lepape (who became a prolific fashion illustrator) were found across the pages of the leading fashion magazines of the day including Gazette du bon ton, Vogue and Harper’s Bazaar. And, of course, the photography of Edward Steichen. 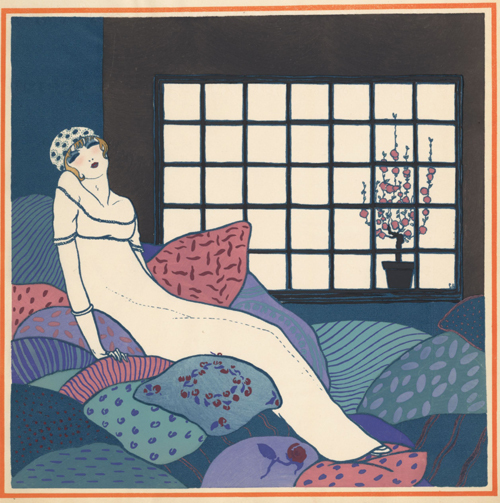 Les Choses de Paul Poiret vues par Georges Lepape, 1911. 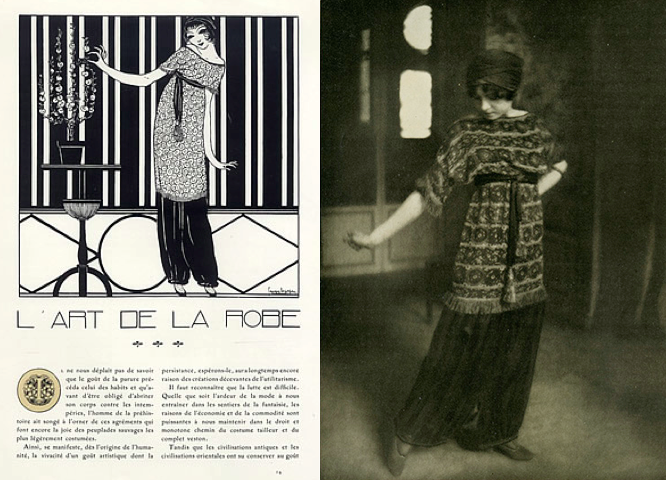 Les Choses de Paul Poiret was released only two months prior to Steichen’s photographs, which accompanied an article entitled “The Art of Dress” in the magazine Art et Décoration. 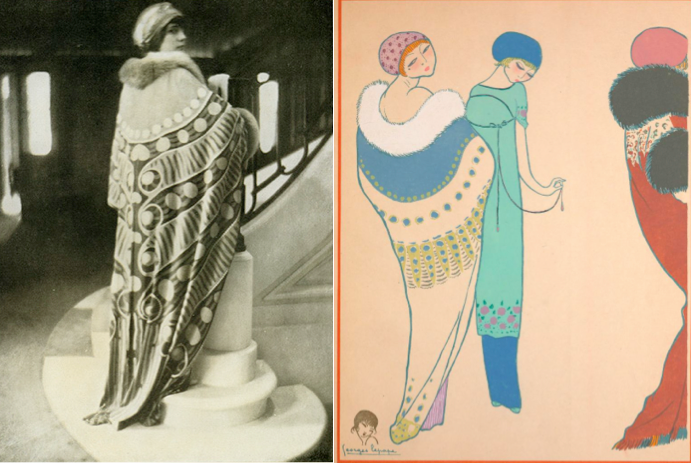 (The fact that it was an architecture and interior design—not fashion—magazine, is yet another example of Poiret’s non-traditional marketing strategy at work.) 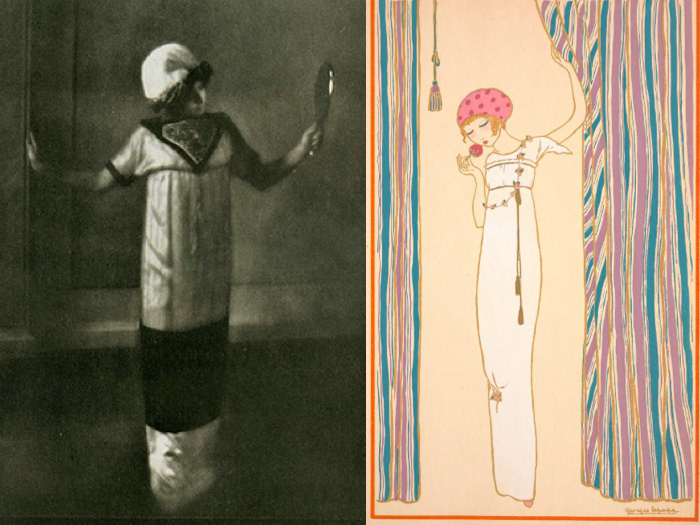 The article begs a comparison between Lepape and Steichen almost immediately, opening with a Lepape illustration of a Poiret jupes-culottes (literally “skirt-pant”) followed a few pages later by a Steichen photograph of the same ensemble. 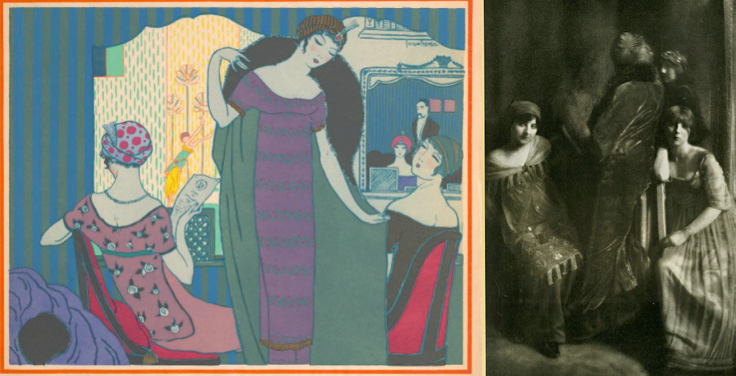 The models are posed in the same way, in the same clothing, but the backgrounds, though both in Poiret’s salons, are different. And yet which came first? I posit that it was indeed the Lepape illustration, as the Art et Décoration article already insinuates, but further comparisons provide the more conclusive evidence that Steichen indeed found inspiration for his revolutionary photographs in Lepape’s illustrations. 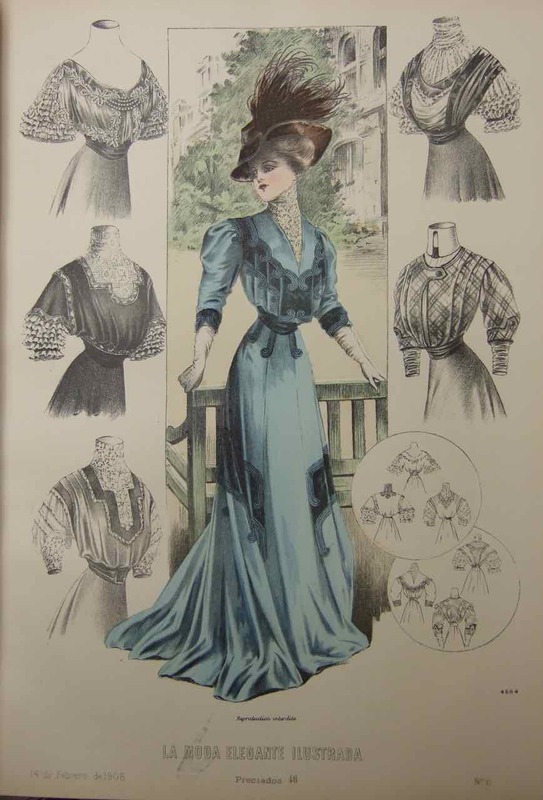 “L’Art de la Mode” or the “Art of Dress” article, Art et Décoration, April 1911. 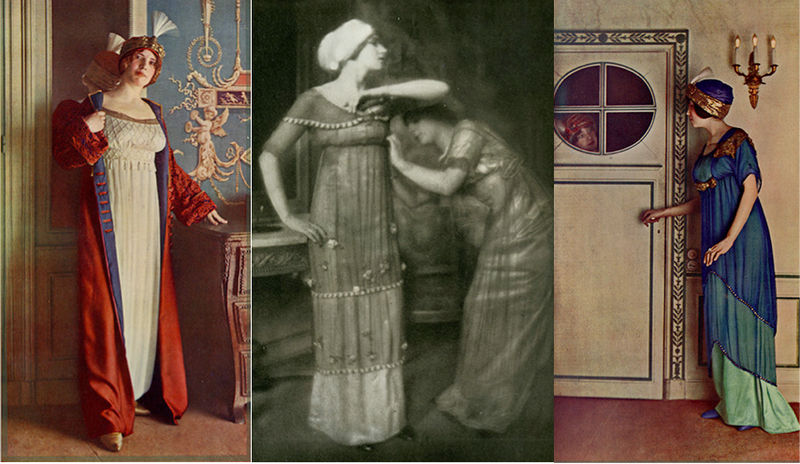 First, we must consider the stylistic elements of Les Choses de Paul Poiret that were worth imitating. In the album, Lepape, like Iribe before him, invites the viewer into an intimate world inhabited by contemplative, fashionable beauties. They walk in and out of frame with ease, lounge on pillows and in chairs with languor. It is a romantic, enticing world in which Lepape has placed less emphasis on any specific detailing of the clothing and more on the mood, beauty, and emotions that their presence evokes in their wearers. 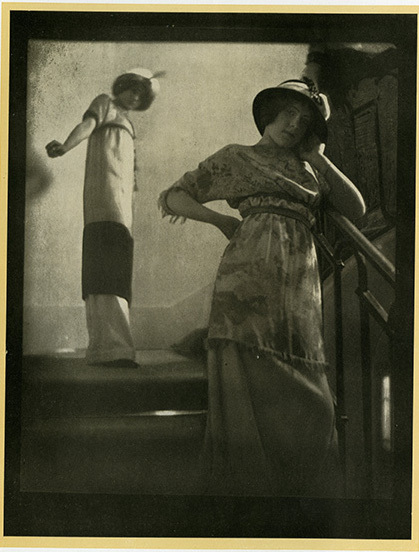 Similarly, Steichen invites the viewer into a low-lit, private domain inhabited by Poiret’s magnetic mannequins. But this time, the women in Steichen’s revery are real, and decidedly more aware of their audience, occasionally staring directly at the camera acknowledging our gaze. The models are none-the-less contemplative of their surroundings, however, nor of their beauty. Hazy lighting enhances the sultry nature of their features and each scene, many in which the models appear mesmerized with themselves, staring at their garments or reveling in their reflection in the mirror. Steichen followed Lepape’s lead on more than just mood and setting. He also mirrored many of the artist’s compositions and poses, as demonstrated below. But as imitative of Lepape’s style as Steichen’s photographs are, they do reveal something only Lepape could insinuate, and that is the realities of Poiret’s designs on the human form. Lepape uses the straight, columnar silhouette of Poiret’s gowns to enhance the statuesque qualities of his figures, but he completely negates even a suggestion at the natural body that exists beneath. These are qualities left to be discovered by Steichen’s lens, found in subtle but equally beautiful ways. Despite the obvious change in medium, Steichen’s successfully imbues his photographs with the same romantic, meditative notions as Lepape’s illustrations, albeit it in a more muted color palette and, quiet literally, in a more realistic way. But both are exquisite testaments to the Art of Dress. 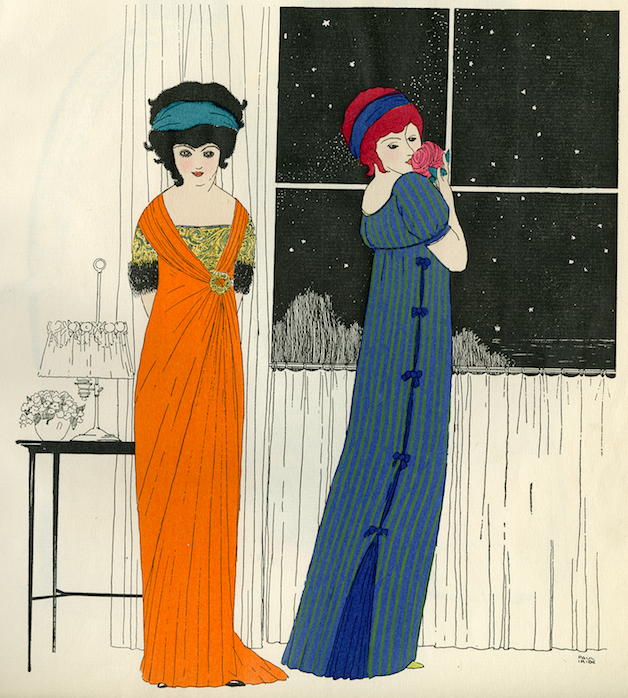 **All images in this article were sourced from the Special Collections and FIT Archives of the Fashion Institute of Technology in New York City where the Art et Décoration issue, Les Robes de Paul Poiret and Les Choses de Paul Poiret reside. Since 1993, Canadian artist Christi Belcourt has been creating visually arresting paintings representative of the floral beadwork of the Métis and First Nation women of Canada. Belcourt herself is of Métis heritage. 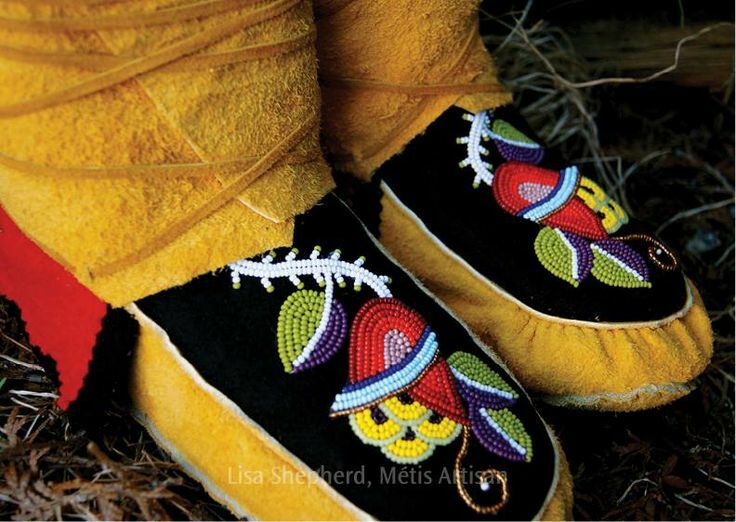 Beaded moccasins by Métis artisan Lisa Shepherd. The intricate beaded works of her people are feats of exquisite artistry, representing the highest levels of craftsmanship. It is an art form cultivated over hundreds of years and is a source of immense cultural pride. Through her work Belcourt has attempted to “transfer the ‘beadwork’ to canvas, and in so doing, add commentary and expression within the work beyond the purely aesthetic. The plants within my paintings have become metaphors to parallel humanity.”[ii] In Belcourt’s “beadwork,”achieved by a series of small dots, sceneries of flowers and wildlife converge into colorful, magnetic feats of the imagination. 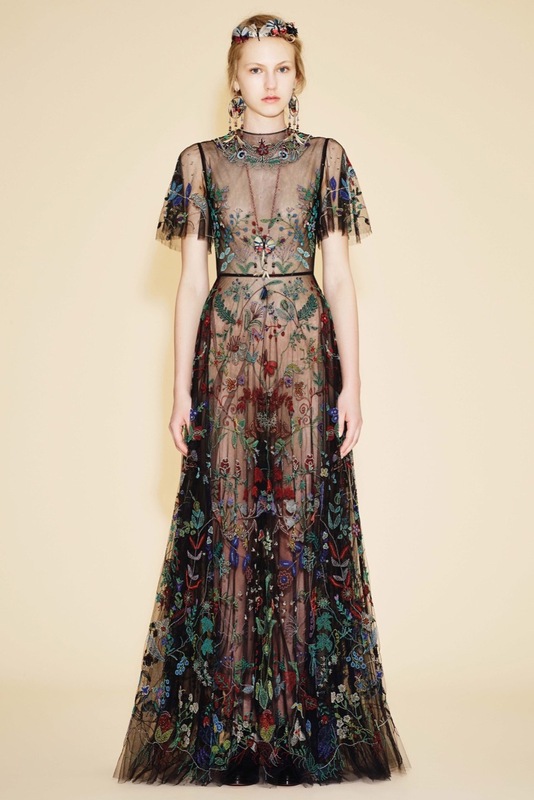 The result of the collaboration is, yet again, another stunning collection by Valentino. See the complete collection here. [i] Lauren Strapagiel, “These Gorgeous Dresses are Based on a Métis Artist’s Work,” http://www.buzzfeed.com/laurenstrapagiel/a-metis-artist-collaborated-with-valentino-on-these-gorgeous?bffbstyle&utm_term=4ldqphh#.knkwEDzM3G. 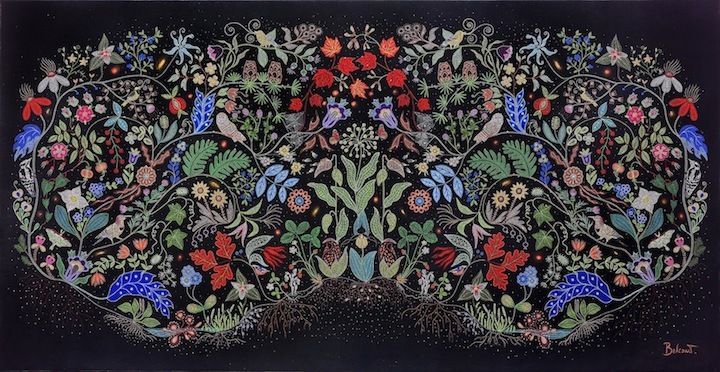 [ii] “Artist Statement on Floral Work,” http://www.christibelcourt.com. 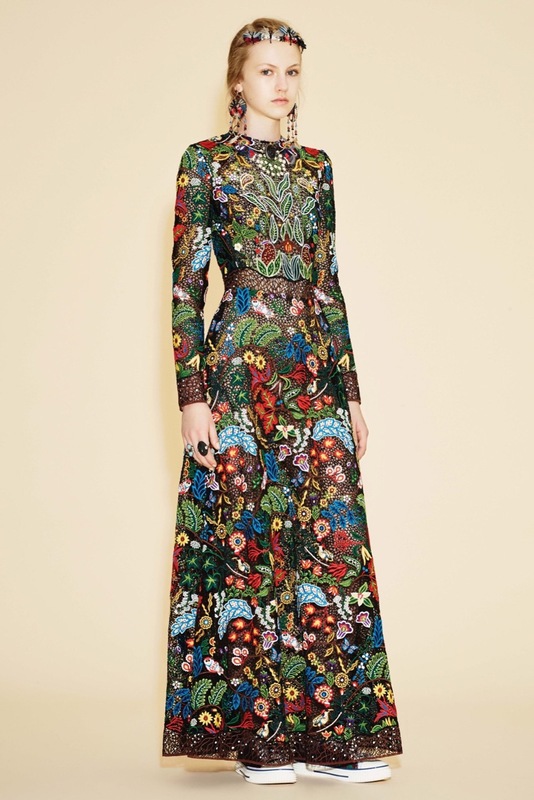 [iii] Lauren Strapagiel, “These Gorgeous Dresses are Based on a Métis Artist’s Work,” http://www.buzzfeed.com/laurenstrapagiel/a-metis-artist-collaborated-with-valentino-on-these-gorgeous?bffbstyle&utm_term=4ldqphh#.knkwEDzM3G.